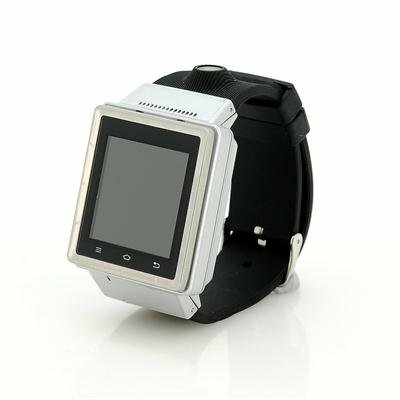 Successfully Added ZGPAX S6 Watch Phone - Dual Core CPU, Android 4.4, 3G, Wi-Fi, 2MP Camera, 16GB SD Card (Silver) to your Shopping Cart. Android 4.4 Phone Watch with Dual Core CPU, 512MB RAM, 2G + 3G cellular Connectivity and micro SD Card Slot. This ZGPAX S6 smart watch has a MTK6572 Dual Core 1.0GHz processor and 512MB of RAM and with 2G and 3G cellular connectivity, it lets you run apps and do all your daily phone activities from your wrist. Coming with an Android 4.4 operating system you can now enjoy the same usability as a Smartphone in the form of this watch, which is incredibly user-friendly. With the Google Play store pre-installed, you get a host of apps for music, games, videos and messaging right where you want it. Despite being the size of a standard watch this little gem has many more functions and the manufacturers were even cleaver enough to install a 2 megapixel camera into the wrist strap. This let you capture all those magical moments and store them directly onto the watch phone's 4GB of internal memory. Should you need more storage space then a micro SD card can be used to add up to 32GB of extra storage space. This product is in stock now, we guarantee next working day shipping and offer a 12 months warranty on all our products. Brought to you by the leader in electronic devices and wholesale Android phones and watches Chinavasion.